Star Wars: The Clone Wars ended in the wake of Disney’s acquisition of Lucas Film. Thanks to the kind folks at Netflix, the last season has seen the light of day. The sixth season dubbed “The Lost Missions” delivers four-story arcs over thirteen episodes that delivers a little something for every Star Wars fan. The mystery surrounding the origin Order 66 produces some startling revelations. We knew Emperor Palapatine was the puppet master behind the murderous directive but he couldn’t have done it alone. The clones’ total compliance in following orders was the assumed culprit for the slaughter of the Jedi. The discovery of how this came to pass will charge your perception of characters and situations you thought you knew. The Jedi/Clone relationship was examined at length throughout the series. Anakin and Obi-Wan treated their combative colleagues as equals while others considered them disposable. It was kind of heartbreaking to watch this relationship unfold knowing what the end result would be. This new turn of events paints them in a different light because they are victims of a higher design. The story was laid out extremely well and told at a pace where all the emotional elements sink in to the degree that you easily put aside what you know and immerse yourself in what could have been. The prequels proved without a shadow of a doubt that politics and trade embargoes are not a desired plot point in the Star Wars universe. But that doesn’t stop George Lucas from giving it one more try. Art imitates life as the galaxy is on the verge of financial collapse. Politics, debates, voting, economics, defaulting on loans, and rising interest rates are all covered in the second arc. The story was told as well as it could have been but not even fire fights and lightsaber duels could draw an allure out of the subject matter. Before I continue, I must confess something that could cost me my geek credit. I’ve never admitted this to anyone so the fact that I’m about to trust you all with this secret should give me some redemption. I like Jar Jar Binks. If you can put aside his cringe worthy fart jokes and his “big poopy” vocabulary, he has some redeeming qualities and those are what come to the forefront in the third arc as he teams with Mace Windu to put the kibosh on some Force stealing treachery. It has the usual elements of the wise and noble hero despising the bumbling idiot until he is proven wrong. Jar Jar is still clumsy but he is not afraid to engage in fisticuffs as he clobbered a pair of evildoers with a Superman Punch. This arc only last two episodes which is wise considering most can only handle our favorite Gungan in very small doses. One of the things that royally pissed me off about Revenge of the Sith is there was no was follow-up on how Sifo-Dyas commissioned the creation of a clone army. We learn how he did it, how intricate the cover up was and just how far back the deception went. The Jedi Council’s discovery and response provide several twists and turns that makes you wonder why this couldn’t have been done in the films. The unraveling of the clone conspiracy smoothly transitions into an important spiritual journey for Yoda. The dark side is clouding his judgment like never before, causing the Jedi Master to doubt himself. 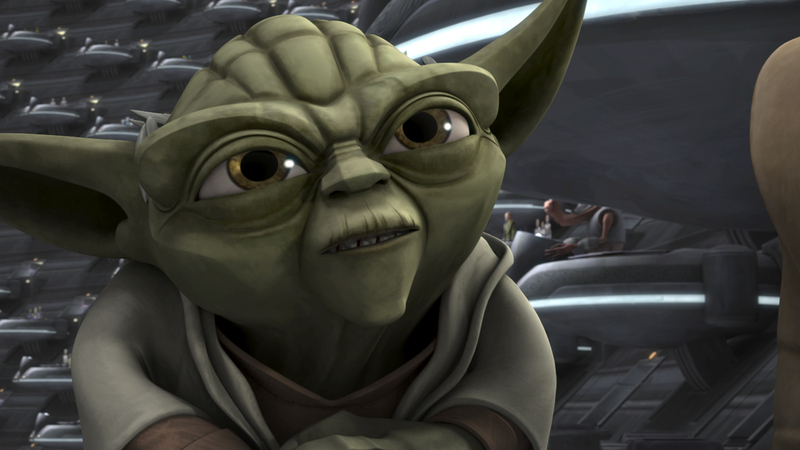 Training is required of him and it’s a fascinating plot device because we assumed he knows all already Yoda did. The Dagobah scenes were extremely well produced and they did right by one of the most essential planets of the saga. The eeriness of the dark and murky surroundings along with bits of John William’s familiar score from Empire Strikes Back amplified the significance of the moment when Yoda enters and faces what he took with him into the cave. While some feel it is good to leave things unanswered, the naturally enthralling nature of Star Wars makes fans crave explanations for everything. The final installment of Clone Wars doesn’t tie up every loose end but it answers a lot of questions without creating more. The strength of this season lies in the exploration of Sidious’ treachery and the realization of Yoda’s higher purpose.